These fun cookies make an ideal edible gift to give and are the perfect creative activity to keep kids (and adults!) occupied. Making sure the pastry is really cold when doing the cut-outs will ensure perfect shapes and an easy job. Put the sugar and butter in a large bowl and beat for a few minutes with an electric beater, until pale and creamy. Beat the egg in. Add the remaining ingredients and beat until well combined into a smooth, soft dough. Bring the mixture together on a lightly floured surface, kneading it into a smooth ball. Roll out to about 4mm in thickness. Put on a tray lined with non-stick baking paper, cover and refrigerate for at least 20 minutes, until firm. Preheat the oven to 180°C/gas mark 4. Line two large baking sheets with non-stick baking paper. To make the buttercream icing, beat the butter in a medium-sized bowl until smooth. Add half of the icing sugar, beating it in well before adding the rest. Beat well to give a smooth mixture. Reserve about 20g and spoon the rest into a disposable piping bag. Snip the tip of the bag to create a 2cm-wide opening and set aside. Remove the dough from the fridge. Using a 9cm round straight-sided cookie cutter, stamp out rounds. Stamp out the centra of each one with a 5cm round cutter. Reroll these inner bits with the pastry trimmings and continue this process until all of the pastry is used up, giving you 18 in total. 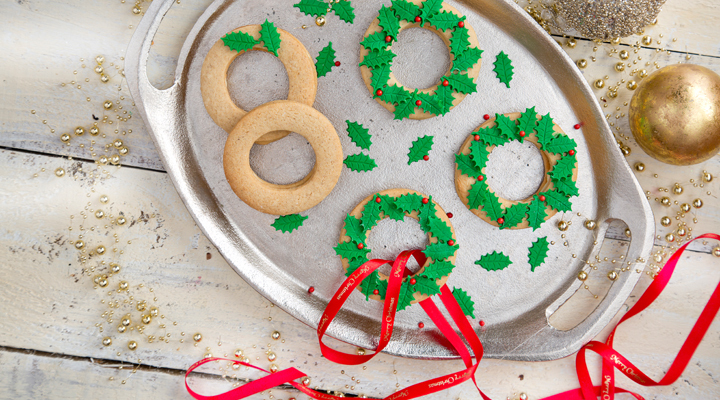 Arrange the wreath cookies on trays as you go. Bake in the oven for 10 minutes, until lightly golden. Remove and leave on the baking sheets for a few minutes before transferring to a wire rack and leaving to cool completely. Meanwhile, prepare the fondant icing pieces. Lightly dust a clean surface with cornflour and roll the icing paste out to about 2mm in thickness. Using the holly cutter, stamp out leaves, remembering to punch the vein pattern on them too. Reroll the icing as necessary to make 126 leaves in total. Cover so they don't dry out and set aside while you fill the biscuits. Using about 20g of the buttercream, pipe it in a circle on the base of half of the biscuits. Put the base of another biscuit on top of each one to sandwich them together. Arrange 14 holly leaves on each cookie, dabbing a little of the reserved buttercream on the back of each one to stick them down. Decorate each cookie with seven red edible balls, pressing them lightly into the stems of the holly leaves to stick. Tie a little red ribbon through each one for hanging or just to decorate if liked. These will last for up to three days layered between parchment paper in an airtight container in the fridge. Tip: For smaller and less calorific portions, don't sandwich the cookies together with buttercream and leave them as individual cookies instead. As you will have 18 cookies in this case, you will need to double the fondant icing quantities. Use edible glue or a little apricot jam to stick the fondant decorations to the cookies in this case.